All of our instructors begin as students of Black Belt Academy and remain in training after joining the instructor corps. By being students first, they truly understand the dedication and determination needed to be successful in Tae Kwon Do. Master Kyle was born just "Kyle" in Bucks County, PA in 1986. His family moved to St. Mary's county when he was 3 years old. As a child, Kyle played soccer and baseball but didn't excel at a sport until he found tae kwon do in 1999. Once he began training, he thrived. He earned his black belt in 2002 and reached the level of Master Instructor in 2010. Kyle was such an amazing student that becoming an instructor was a natural transition. From there he progressed to the owner/operator of his own dojang, the Black Belt Academy, in December 2005. Kyle graduated from Great Mills High School and obtained a degree in General Studies from CSM. He now lives happily in Lusby with his wife and 5 children. Outside of the studio, Kyle enjoys fishing and fixing cars. Melly began her journey to black belt at the age of eight. She earned her black belt in April of 2016 and is currently a 1st dan. Melly became a welcome addition to the group of instructors in mid-2017 due to her enthusiastic personality and dedication to Black Belt Academy. Melly regularly performs with the Huntingtown High theater group either on stage or behind the scenes as a tech. Next to tae kwon do, theater is her passion. She loves music and anything related to the arts. Molly has been an instructor for two years and is a 1st Dan 6th gup black belt. She is currently the librarian at Windy Hill Elementary School and was at Plum Point Middle and Calvert Library before that (so you can call her Conan the Librarian!). She is mama to Sebastian and likes reading and Muay Thai boxing. Peter is a 1st Degree Black Belt that started his training at age 5 because he wanted to learn the high flying kicks and "ninja moves" he saw watching Jackie Chan and the martial arts masters in movies. Peter chose to become an instructor at BBA because of his love of the sport and his desire to share that with students. He is truly a patient and kind instructor, not to mention, a lot of fun! Believe it or not, he does have a life outside of the do jang! Peter is attending college and loves to play football as well as train in several different types of martial arts. When asked if he had any special comments about his time at BBA, Peter said, "I consider the BBA my second family and I wouldn't trade it for anything in the world". Amber is a 2nd degree black belt that began studying tae kwon do at the age of 9. She became an instructor in November 2016 because she wanted to give back to the students and enjoys teaching them something that may help them one day. Besides being a phenomenal athlete, Amber is an accomplished piano player and loves to read. Taylor has been an instructor since late August 2015 but started as a student in 2011. She loves what she does and where she works. Rhoge joined the Instructor family in Spring of 2016. He began his study with BBA in the fall of 2014 and is currently a red belt. Rhoge says that he loves working with the kids "because it's like your cliche teacher-student thing, you learn something new from each other". Angela started out at BBA as an assistant Toddler Class Instructor in February 2015 and quickly transitioned to teaching all levels of classes. She was in training as she was teaching and worked her way to her black belt in May 2017. Angela has two children of her own and loves working with the students of BBA. In her free time, Angela enjoys canoeing and environmental sciences. Jordan began taking Tae Kwon do at the Black Belt Academy in 2004. He earned his black belt in 2007. While in training, Jordan won gold and silver medals in the National Tae Kwon Do Competition, as well as a silver medal in the Jr. Olympics. He has always had a passion for the sport, as well as competition. 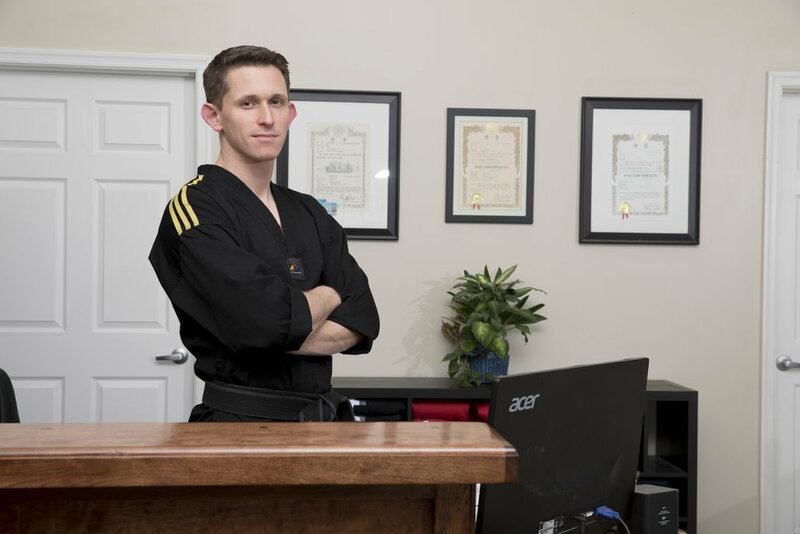 He took a short break from his studies and returned to the Black Belt Academy in 2015, to work as an instructor to get back to doing what he loves and sharing his knowledge and experiences with others. Samantha began her training at the Black Belt Academy in 2011 to join her brother, and fellow instructor, Steven, on their journey to their black belts. Currently Samantha is a full-time student at Marymount University studying to become a Physical Therapist. Samantha has always had the desire to help other people, and joining the instructor corps 5 years ago gave her the opportunity to help others through her love of tae kwon do. Oddly enough, Samantha DOES have a life outside of tae kwon do. When she is not studying or preparing for exams, she enjoys spending time with her friends, going to the gym and sometimes makes bracelets. When asked for any special comments about her time at BBA Samantha said, "BBA has been my second home for 6 years now and I am looking forward to many more!" Steven began training at BBA in 2005 and became an instructor in 2015. He is a 3rd degree black belt that loves working with the students. Steven enjoys getting to know each student individually because each has something different to add to our tae kwon do studio.